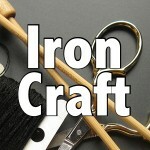 I gave myself a real challenge when I posed the theme of France for Iron Craft. I didn’t have any immediate ideas for a project, but knew I wanted it to be something for my new home. I love the texture a grouping of French knots make and thought wouldn’t it be cool to use that texture for pillow, just make the knots really big and plush?! It came out just as I hoped. 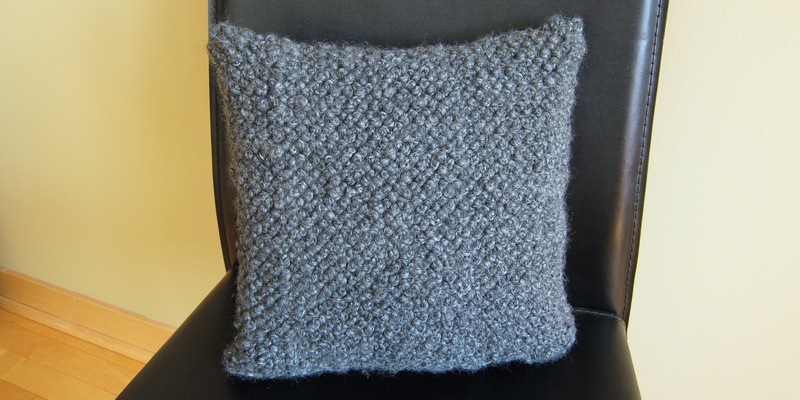 I used Lion Brand Wool-Ease Thick and Quick for the yarn because I loved the heathering in the gray. I think it just adds to the texture while staying monochromatic. 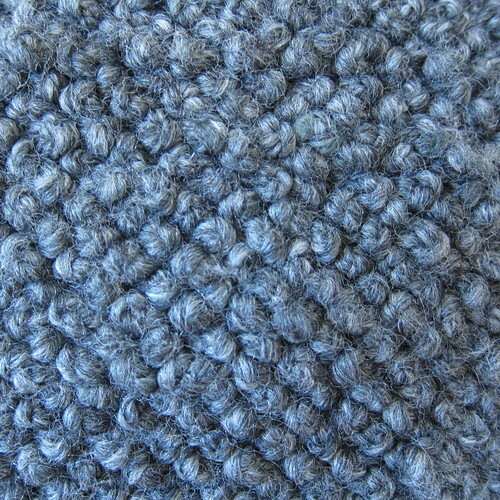 You want a super bulky yarn so that you don’t see the mesh through it. You want to end up with a carpet like fabric. This was actually a really fun project, great for something easy while watching tv in the evenings. Once I got into a rhythm with the knots, I could do about 12″ x 2″ of them in two hours. It took about six evenings for me to finish the top. 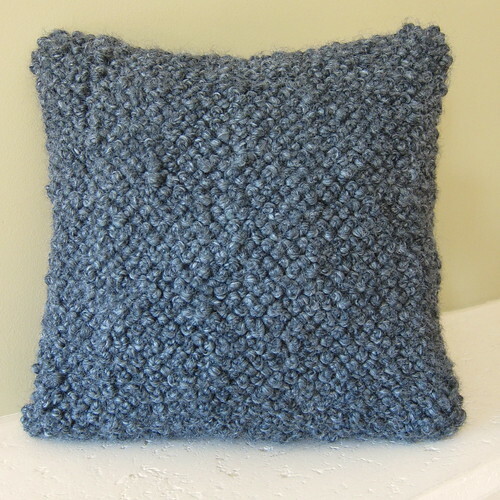 These supplies will make a 12″ x 12″ pillow, but you can easily adapt it to any size you wish. 1. Stitch double French knots on to the mesh – You will be stitching on lines of French knots in the middle 12″ of the mesh leaving an 1″ of empty mesh on all sides. 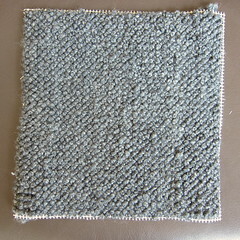 My mesh is marked out in 2″ squares. Cut a long length of yarn, about a yard or so, thread on to the yarn needle and knot the end. Pull through a square at one corner. 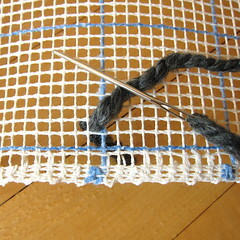 Wrap the yarn around the needle twice near where it comes through the mesh. 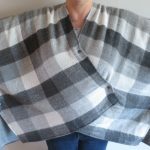 The wraps do not need to be super tight around the needle. If they are too tight it will be hard to pull the yarn through and a looser knot will give more texture to the finished piece. 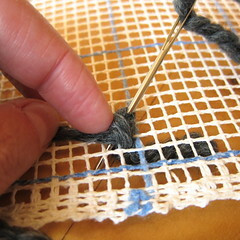 Put the end of the needle into the next square and pull the yarn through to create the French knot. 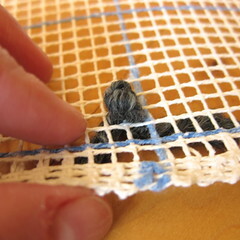 I find it helps to hold the wraps in place with a finger while you are pulling the yarn through. 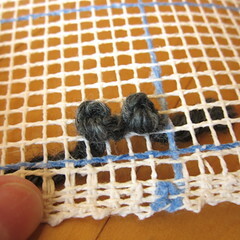 Also, keeping the tail you are pulling through untangled will make it go smoother. Continue down the row in the same manner until you have done 12″ of knots. Turn and work back the other way on the next row of squares. 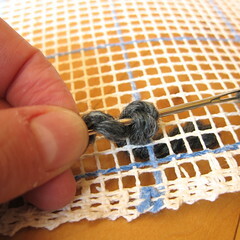 When you get to the end of the piece of yarn either knot the end or weave it into the back of the existing stitches, then start with a new length. Work until you have a 12″ x 12″ inch square of knots. 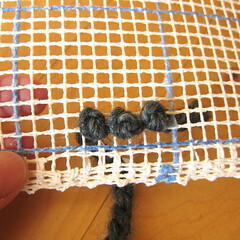 Trim the empty mesh to about 1/2″ all the way around for your seam allowance. 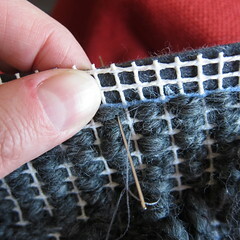 You want to sew it together just inside the holes containing the last row of knots making each stitch around a bar in the mesh. I like to catch a little of the yarn in each stitch too. Make sure to push the knots away from the seam as you sew. 3. 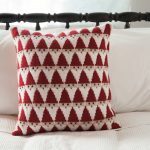 Carefully turn the pillow right side out and slip the pillow insert. Sew the last side shut. 6 years ago by Kat in Challenges , Embroidery , Embroidery Projects , Iron Craft , Needlecraft , Projects , Sewing , Sewing Projects | You can follow any responses to this entry through the RSS feed. You can leave a response, or trackback from your own site. That came out great. Nice job. What a great idea! I wish I would have thought to do french knots, it would have made it easier to think of a project. Looking forward to seeing the next challenge! What a wonderful project but so time consuming. You really had to plan this one in advance. Great results and the color is amazing. 5 hpi is almost impossible to source. If I make it from 4.5 hpi will the knots still work? I realise that if I change the mesh size then some overall size adjustment is needed…but I wanted to know if the hole size would be ok for french knots.